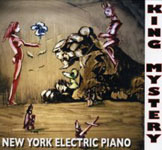 Expanding their trio to a septet for King Mystery, New York Electric Piano has fashioned an invigorating, woven work out of the cotton basics of jazz and swatches of futuristic fabric. Most notable in this mix is the addition of Leon Gruenbaum and his self-invented MIDI instrument the Samchillian, though it's difficult to know for sure what separates Gruenbaum's Samchillian playing from the contributions of Mal Stein, who is listed simply as providing "soundscape." But with an album entitled King Mystery this confusion is no doubt an intentional key to the group's point. Even Till Behler's sax and flute often rise organically (if Gruenbaum and Stein's space-age sounds can be considered organic) from the electronica. And Deanna Kirk's vocals, often sung in tandem with Pat Daugherty, are Sun Ra-like intonations softened by a melodic grace characteristic of the vocals on Ornette Coleman's The Complete Science Fiction Sessions (1971, reissued expanded Columbia, 2000). 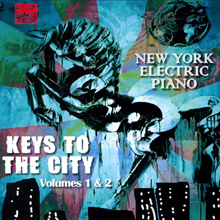 Pianist Daugherty, the ostensible leader of the group and composer of all the album's titles, lays down, by comparison, a rather more traditional Monkish bop that, to employ another eco-analogy, provides vibrant greenery to the otherwise ethereal pieces. His piano works especially well, in consort with bass and drums, behind Kirk's vocals, giving them the grounding of a nice, swinging lounge feel that the keyboardist from Saturn himself favored. NYEP wastes little time lyrically addressing the project's stated royal concern. On "Why Are We Here?," Kirk and Daugherty's swinging chant offers up love as the answer to our perhaps unanswerable quest to find meaning in the universe. This secular vein continues on "Temple Tantrum," a kicking ode to dance that borrows a religious precept to celebrate the body and its joyful expression of being. "Hymn including the beauty of ambiguity," the album's best song, provides more dance-club-worthy vocals that nonetheless grip the mind. "It's all bad/It's all good" Kirk and Daugherty sing, refusing to pin down mystery, before calling off a string of lyrics that incorporate titles of the album's instrumental piecesthe ever-unknowable twining of existence continues. Shifting between its driving dance rock, straight-ahead modern jazz and otherworldly freak-outs, King Mystery combines words and music, past and present, critique and joy in a way that keeps the mind and body both moving. Is there much more you can ask for from music? Track Listing: 10 to 11; The Black Hole, the Lasso and the Loophole; Why Are We Here? ; The Wheel; Temple Tantrum; Fireblossom; Too New To Know; King Mystery; Hymn including; the beauty of ambiguity; Legend of Baj; I Shot the Deputy; Road to Newport. Personnel: Pat Daugherty: pianos, vocals; Aaron Comess: drums; Tim Givens: bass; Till Behler: saxophones and flutes; Leon Gruenbaum: samchillian; Deanna Kirk: vocals; Mal Stein: soundscape.